Riding the rails of America was a long-time lyrical passion for Johnny Cash. He wrote at least a dozen train songs including Hey, Porter!, the B-side of his first Sun Records single. He also recorded a couple of dozen more in the public domain and by other songwriters including Casey Jones, heard on the CD Mystery Train. In the liner notes to that compilation, Norm Cohen states that "Johnny Cash has established his credentials as far as railroad songs go: he has recorded them more than almost any other country singer, and featured them on his television show in 1969-1971." 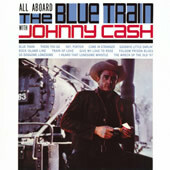 Cash's 1955-58 Sun repertoire was infused with songs about trains. In his own words Johnny stated, "I think the first time I knew what I wanted to do with my life was when I was about four years old. I was listening to an old Victrola, playing a railroad song. The song was Hobo Bill's Last Ride by Jimmie Rodgers. I thought it was the most wonderful, amazing thing that I'd ever heard." That early influence by Rodgers, heard on Steel Rails, doubtlessly shaped Johnny Cash the songwriter and the passionate singer of songs about trains. The DVD Ridin' the Rails—The Great American Train Story provides further evidence. Enjoy!